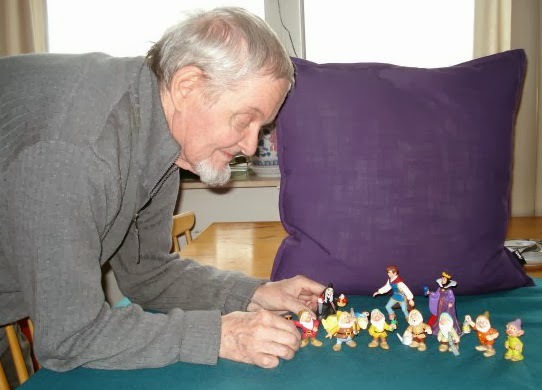 Born in Denmark in 1929, Harry Rasmussen first saw Snow White and the Seven Dwarfs on Christmas Day in 1938 when he was 9 years old. The event would have such a lasting effect that animation would become his life's work. 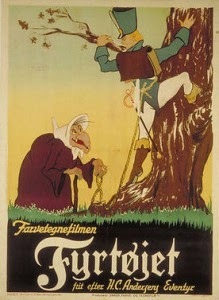 As a 14-year young man, Harry became an apprentice animator on the first Danish animated feature, The Tinderbox (Fyrtøjet). And as an adult, he was employed with Nordic Cartoon Films in Copenhagen. Being in the "biz" allowed him some special opportunities, like the day back in 1959 when he got to meet Walt Disney who was traveling in Europe and visited the studio. 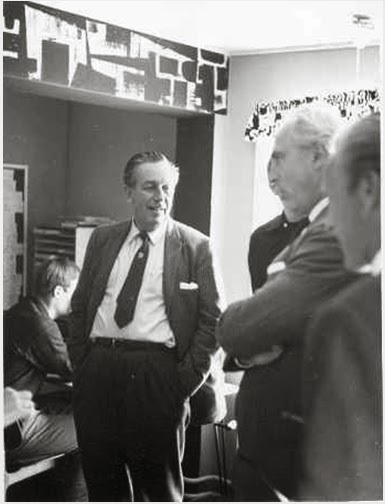 That's Harry's hand in the lower left of the photo below...To the left of Walt Disney is animator Anton Fredsøe. On the right is the director of the Metropol Theatre and Mickey Mouse Corporation of Denmark, Jørgen Jørgensen, and the Director of Nordisk Film Junior, Ove Sevel. Behind Jørgen Jørgensen (in dark shirt) is Ib Steinaa. Photo © 1959 Paul Dupont and and Dansk Tegnefilm Historie/Harry Rasmussen. Ward Kimball with his wife Betty visited in 1965...In the courtyard at Nordisk Film in Valby, Ward behind the wheel, beside him Walther Lehmann. Rear passengers from left: Flemming Jensen, Kirsten Steinaa and Betty Kimball. 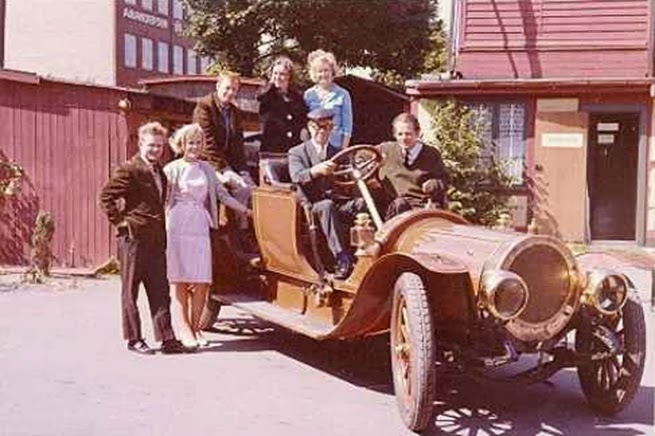 Standing beside the car (which had been used in the filming of the 1962 movie "The Dear Family") are Harry Rasmussen and Anne Lise Andersen. Photo taken by Henning Bahs with Kimball’s camera. 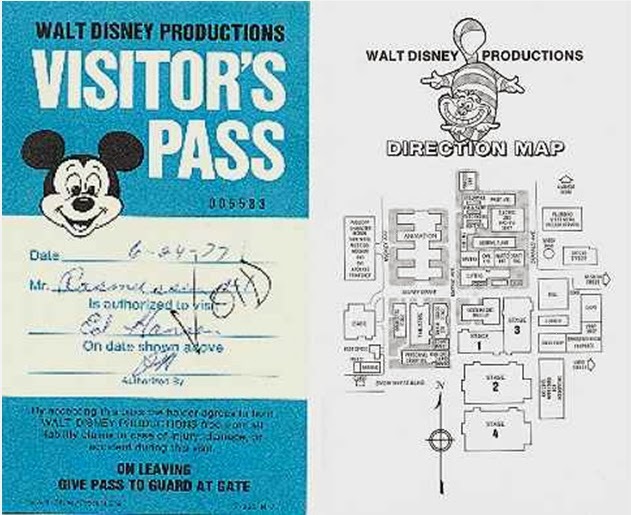 In 1977 while on vacation in the States, Harry received an invite to The Walt Disney Studios in Burbank where he met Frank Thomas, Ollie Johnston, Eric Larson, Woolie Reitherman, Ken Anderson and Vance Gerry. They even asked Harry to come work for the Disney Studio, but he had to decline because it would mean uprooting his family from Denmark. Harry first heard the name of Walt Disney when Snehvide og de syv Dværge (Snow White and the Seven Dwarfs) officially premiered in Denmark on September 29, 1938. But he would not have an opportunity to see the film until nearly three months later when the movie was shown simultaneously on Christmas Day in major provincial towns, and later also in the small town cinemas. I saw the film publicized on the cinema facade, and when I looked beyond the iron grid that sealed off the entrance, I caught a glimpse of some life-sized figures of dwarfs. They were cut from plywood and installed in the hall and partly overhanging the cabinets on either side of the entrance, where behind the glass windows were suspended a number of pictures with scenes from the movie, as was common at that time. It was so breathtaking, that on the following day after school, I rushed back to the cinema hoping to see more of the images in the showcases. But since it was outside of the opening hours, the iron front gate was closed and locked. Yet by pushing my head close to the bars, I managed to get even more of a glimpse of film images that enthralled me. 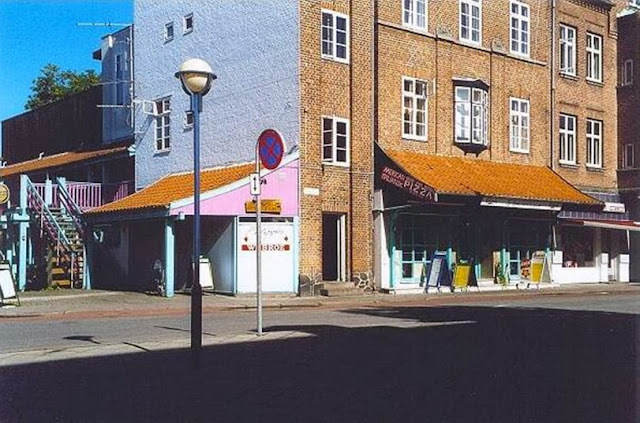 The theatre was located on the corner of Railway Street (Jernbanegade) and Dana Street (Danagade). The entrance was under the red canopy where now there is a pizzeria. The dark building that can be seen at the left rear of the picture is the old cinema. This photo was taken during a visit to Nakskov in the summer of 2001, © Harry Rasmussen. Christmas Day 1938. With his father staying home with the two younger siblings, Harry was accompanied by his mother as they headed off to see Snow White for the first time. Mother could not at that time have done me no greater joy or service than when she took me into the KINO to see Snow White and the Seven Dwarfs. The film was a great and profound experience, indeed, a revelation for me, and probably for many others that were there for the sold out performances. My concern was whether there were any tickets left when we reached the ticket sales, as we stood in a long queue, which went right into the street and around the corner of the cinema building. When the queue would slowly move forward, I have an opportunity to revisit the exhibited frames in one showcase, which we came close to during the excruciatingly long wait. And when we at last reached into the hall, I saw some of the great figures of dwarfs, cut into plywood and painted in vibrant colors, which were placed around the room, and mom and I passed close to two of the characters, “Dopey” and "Doc". I was almost feverish with excitement at the sight which imprinted itself deeply and unforgettable in my highly susceptible child's mind. The curtain slowly and almost ceremoniously opened while the musical overture came from the big speakers. My eyes were immersed in the vividly drawn shapes, the brilliant colors, and the glorious scenes on the silver screen. And my ears on the beautiful music and the most catchy tunes one could imagine. They were quite familiar by this time, being played almost daily on the radio. Harry shares some insight into the Danish voice actors and singers that were apart of this original release. Operetta singer Annie Jessen (1915-1993) and Marius Jacobsen (1894-1961) laid the Danish voices and singing respectively for Snow White and Prince. I will never forget, because they were part of the first spell of the film. Many years later, the film's Danish soundtrack would be re-recorded with different and new actors. Although the result was good, it can never really measure up to the original Danish version, at least not seen with my nostalgic eyes. As a boy I did not know the Danish actors who voiced the Wicked Queen, Witch or dwarfs. But many years later, I managed to find out it was none other than Clara Pontoppidan, who placed her wonderful voice to both the Queen and the Witch. For the dwarfs: Alfred Arnbak (Happy), Carl Fischer (Bashful), Aage Foss (Sneezy), Sigurd Langberg (Grumpy), Valdemar Lund (Sleepy), Victor Montell (Doc). One source believes, however, that Svend Bille, Rasmus Christiansen and Albert Luther also did dwarfs voice work, but I have not managed to verify this. The music and action were so well planned that you were left feeling quite happy and pleased when the curtain was slowly drawn and the lights were lit in the hall. Mother and I had to trudge the relatively long way home in the semi-darkness and cold of the night, but I barely noticed. I was so filled with thinking about the film that I almost felt like I was in another world, or more precisely, in Snow White’s adventure world. And to think, this world still lives in me, even now as an 84-year-old writer of these lines. It most surely is due to having retained a childlike spirit in spite of all the less pleasant and evil that has happened in the world since that time in 1938, which of course should not be ignored. But one should not forget to remember all the good things that have occurred too. The fairytale of Snow White and the Witch or the real-life light and dark constitute the larger LIFE ADVENTURE, which we ourselves all play and have a role in. Harry retired from his career as an animator in 1991. 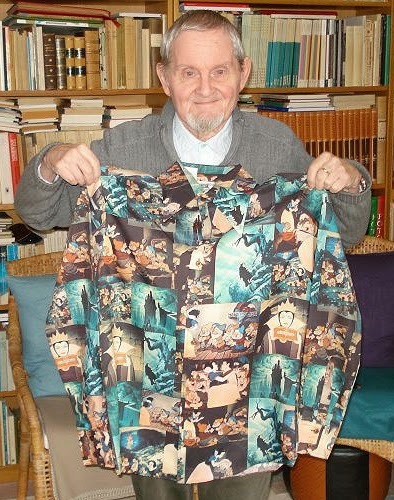 Here he is today, holding a Snow White shirt that was purchased while visiting Disneyland in 1977 with his daughter. It's never been worn but instead has been saved as a remembrance from his trip. Harry with a set of Snow White figures that were a gift from his wife some years ago. Photos courtesy of Harry Rasmussen. Special thanks to Harry for sharing these Snow White memories with us. Harry's website can be viewed at Dansk Tegnefilms Historie 1919-2000 (The History of Danish Animated Cartoons 1919 - 2000). Wow, what a wonderful story - I love stuff like this! I wonder if Walt knew how many people were deeply moved and influenced by "Snow White"? Hope so. Thanks for the great post! It's quite an amazing feat to really touch someone's life while you're alive. But to continue to do so almost 50 years after you've passed, that's something else altogether. Yet, Walt continues to do just that. September 2020 Vacation Booked !!! !